The term organic can be applied to plants, animal based food products, fish or seafood. Simply stated, organic food is grown or produced without using synthetic fertilizers, pesticides, antibiotics, genetic engineering, growth hormones, artificial ingredients and irradiation. How will I know if a food is organically grown or produced? Different countries around the world have different ways of labeling organic food and produce. In the US look for the word "organic" or the USDA Organic seal. The USDA Organic seal assures consumers of the quality and integrity of organic products. 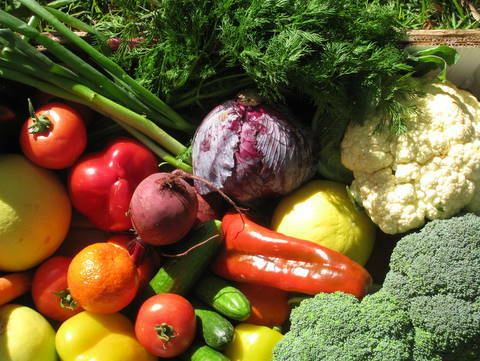 Many studies over the past 10 years have been conducted on organic produce and foods. To date there are no conclusive studies that definitively support the claim that organic food is more nutritious. But many studies do show that they may have increased amounts of phytochemicals, protein, vitamins or minerals. Certain studies have also shown that there are fewer harmful ingredients, such as pesticides and heavy metals, in organic foods. Together, this makes organic foods a better choice for health. Can I just wash and peel produce to avoid pesticides? Pesticides and other chemicals are in the flesh of fruits and vegetables (some more than others). Washing and peeling will help reduce the pesticides, but they cannot be removed completely. Taste is a subjective matter, but many gourmet chefs around the world are choosing organic food to prepare because they believe it tastes better and is of higher quality. Along with the chefs, many consumers are choosing organic food since it tastes better. It is thought that since organic food is grown in well-balanced soil, it absorbs more minerals and nutrients, which improve taste. Try organic and see what you think! In the US organic farmers don’t receive subsidies from the government that conventional farmers do. This results in a price of food that reflects the TRUE cost of growing produce. Usually organic farms are smaller and have higher labor and management. Use the table below to help prioritize which fruit and vegetables to buy organic. Which organic produce should I buy? Not all fruits and vegetables were created equal. The amount of pesticides absorbed by different plants varies. Remember that it is better to eat non-organic produce regularly, than to only occasionally eat organic fruits and vegetables. Below is a table to help you prioritize which produce to buy organic. Print out the table and put in your wallet or hang on your refrigerator to help you when grocery shopping. The following table lists a more extensive list of produce from lowest pesticide levels to highest. The score represents the total score for each produce item, based on six different tests on pesticide levels. Items with high scores have the highest pesticide levels and are best bought organic, while items with low scores can be bought non-organic. Where can I learn more about organic foods? The US National Organic Program regulates the organic program for the federal government. It is a part of the U. S. Department of Agriculture. Consumer’s Union publishes Consumer Reports magazine. Click on the "Food" tab for details about organic products. Organic Trade Association represents the organic industry in the United States, Canada and Mexico. Environmental Working Group is a nonprofit organization. It supports health policies within the US government and educates the public.